Have you ever wondered what it is like to be an archaeologist? Join us for our Hands-on Workshops as we continue the process of documenting, sorting, and preserving artifacts excavated from an actual South Florida archaeological site. We will teach you how recognize and sort ancient pottery, snake, bird, and mammal bone, shell and stone tools and much more. Learn the techniques used by archaeologist to clean and preserve pre-historic artifacts and the proper methods of recording your discoveries. Future workshops will teach field techniques and include visits to sites currently being excavated with an opportunity to join working dig teams! Our affiliated organizations are an integral part of the Museum. They offer public lectures and meetings for all those who are interested in anthropology, archaeology, and paleontology. A chapter of the Florida Anthropological Society, the GCAS meets monthly, September through May, in Broward County. The primary focus of interest is on the archaeology of southeastern Florida. 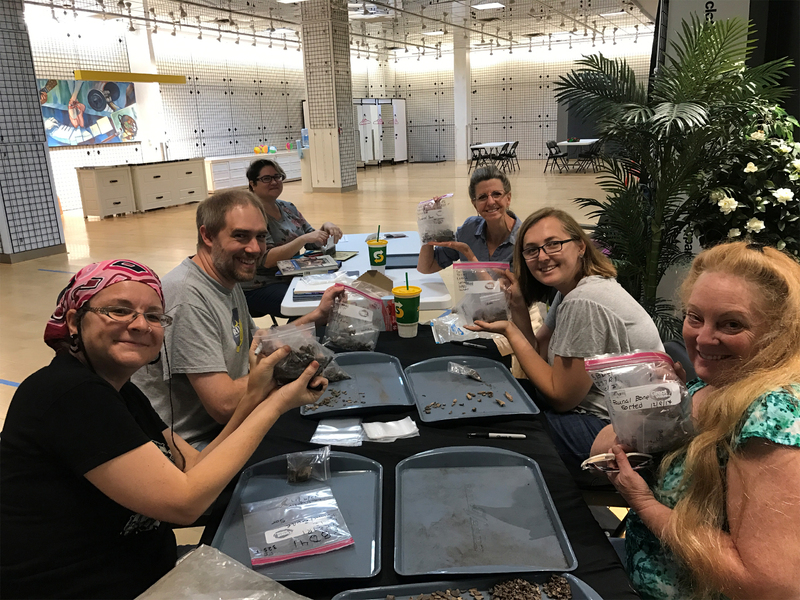 The lectures series is supplemented by occasional field digs and volunteer meetings where members assist the Museum staff in sorting and preserving archaeological materials. ​Each year Archaeological Institute of America provides the chapter with several outstanding guest lecturers. They are internationally recognized as leaders in thier field and often present as yet unpublished and cutting edge information as part of their talks. The topic range is world wide and the scope extends from pre-historic times through the modern period. The FIP is the volunteer branch of the Museum's Department of Paleontology. Here, members can get hands-on training and experience in fossil preparation, exhibit construction, and, when qualified, field excavation. A guest lecture program also lets members in on the latest paleo news and findings, even before they are announced to the public. If a picture is worth a thousand words, the real thing is worth a thousand pictures! Our experts will bring both actual fossil specimens and artifacts to your classroom along with full-size or scale replicas of dinosaurs, ancient mammals, early humans, and prehistoric tools. The Museum’s instructors are highly qualified and hold either a Ph.D or masters degree in their fields. And they are not only experienced in the classroom but also bring years of actual field research to their presentations. Our instructional packages are based around several specific themes and are listed below. Dinosaur hunters! What is it like to be a paleontologist? How do they know where to look for dinosaurs? How do they dig them up and, by reassembling their bones, how do paleontologists know what those extinct animals looked like and how they lived? Replicas used for classroom instruction may be as long as eight feet with smaller, actual fossil specimens, included in the presentation. Travel back to the Florida of 12,000 years age when ice covered much of our continent and the Everglades was vast grassland where many strange and usual creatures roamed. This presentation features a seven foot long replica of a saber-toothed cat and replicas of Paleo-Indian tools and weapons. Who were our human ancestors and how did we come to be? Expedition Origins traces the evolution of the human species, via the use of museum quality replicas. They are all here, from Australopithicus, to Neandertal, and Cro-Magnon. Darwin is also here, and his theory regarding "the decent of man" can be explained and better, seen, by a comparison of these fossils replicas. The Peace River in Arcadia Florida is famous for yielding the bones of such animals as mammoths, mastodons, giant ground sloths, and even saber-cats. Huge shark teeth abound as well. Look for our popular Peace River fossil collecting expeditions to once again be offered during the Fall of 2015.